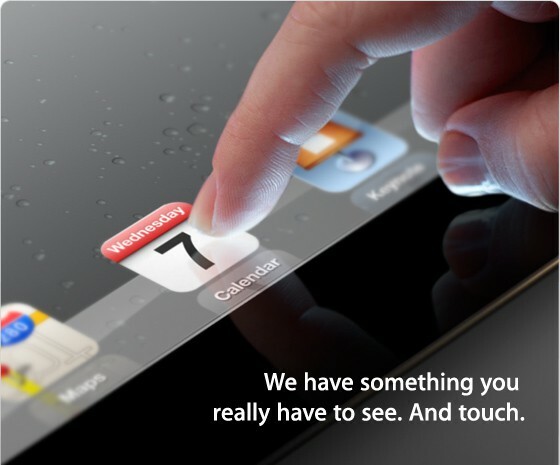 It seems pretty likely that the invitation to Apple’s iPad 3 event includes a shot of the new model. The display is particularly sharp and smooth – just like the anticipated retina display for the device. The spacing of the icon’s on the iPad 3 pictured on the invite clearly indicate that it’s in portrait orientation rather than landscape. But there’s no sign of a home button, a design change that Apple has been allegedly been toying with for some time. In fact, there were rumors that the iPad 2 would be the first iOS device to ship without a home button. Google has already deprecated the use of physical buttons on devices and moved to software-only onscreen controls. It looks like Apple — long a hater of physical buttons — has decided to join them. Or the whole thing could be upside down.